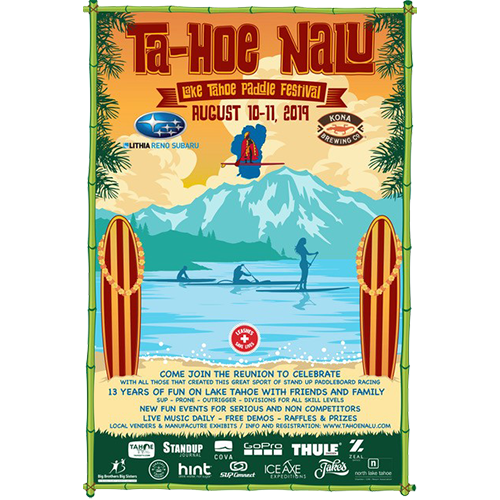 Join us on August 10 – 11 for the 2019 Ta-Hoe Nalu Paddle Festival weekend! Our Official Ta-Hoe Nalu Paddle Festival sponsors make the Ta-Hoe Nalu possible, and we’re very grateful for their support. Stay tuned for more information about this year’s exhibitors. You’re going to enjoy all the equipment, and companies to come! Take a look at all the wonderful food available at the Ta-Ho Nalu. We’re sure you’ll find something to wet your appetite for a fun-filled, festival day. Take the most beautiful Lake in the world, gather the best SUP athletes on the planet, mix in a little Aloha, and you have the perfect recipe known as the Ta-Hoe Nalu. You can feel the family vibe on the shore as the sweat and smiles are shared in the water. History is made every year on the North Shore of Lake Tahoe… become a part of history… come to the Ta-Hoe Nalu. One of my favorite events every year…I can’t keep the smile off my face. New, Fun Events for 2019! We Need Volunteers for the Upcoming Ta-Hoe Nalu!